Since 1979, professionals tracking the online content industry have relied on Business Information Markets for an accurate and unbiased inside look at the industry—from the latest mergers and acquisitions, to subscriber growth estimates, to the technology trends that are constantly reshaping the dynamic business information market for creating and distributing content to business professionals. 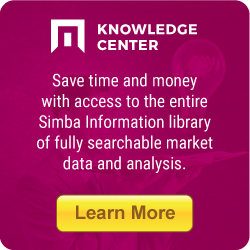 Deciding which subjects to include in the market is subjective, but Simba Information has set report parameters based on in-depth interviews with top business information executives in the electronic information industry. Simba has also tapped into its own institutional knowledge, accumulated during 34 years of market research. Simba provides each market category definition at the beginning of corresponding chapters of the report. Business Information Markets 2012-2013 covers all business information services that provide content, delivered through proprietary online networks, the Internet and handheld wireless devices. It contains the market intelligence needed to evaluate current trends affecting the information industry, and to get an inside track on where future growth is forecast to occur. No other report delivers as comprehensive and all-encompassing an overview and outlook, broken out by major vertical segments: general news and research, financial, brokerage, legal, tax, public records, health care and other online information services. Business Information Markets 2012-2013 also includes 16 detailed company profiles of leading business/professional online content providers, such as Reed Elsevier, Dow Jones, Hoover’s, Reuters, WebMD and more.